Curo, the Bath-based housing association, is to host a public information exhibition to showcase its proposals for the city’s first new park in 100 years. Visitors to the exhibition will be able to see detailed designs for the main area of public open space and woodland walk at Curo’s Mulberry Park development, alongside proposed improvements to Pope’s Walk bridleway. Curo chief executive Victor da Cunha said: “We’d like to thank our stakeholders and residents in Foxhill, Mulberry Park and Combe Down who’ve taken the time to attend our previous workshops and exhibitions and helped us shape the plans for the new public open spaces at Mulberry Park. The exhibition will take place at The Hub at Mulberry Park from 3pm until 7pm on Tuesday April, 16, and will also offer residents the chance to trial free activities currently on offer at the community centre. Mulberry Park is Curo’s flagship development of 700 homes, open spaces and community facilities on the former Foxhill MoD site on the outskirts of Bath. 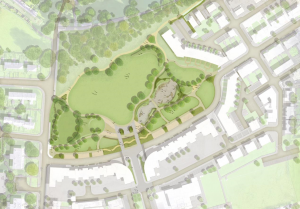 Curo will submit the developed proposals for the park to Bath & North East Somerset Council for approval next month. Subject to planning permission, the park will be open to the public in 2022. Manager of The Hub Lizzie Irvine said: “This event is all about the community, from getting involved in the plans for their new park to joining one of the free 30-minute taster classes offered by the fantastic instructors at The Hub. Curo provides affordable homes and high-quality care and support services across the West of England, managing more than 13,000 homes and building hundreds more each year.